Remember earlier this month when I mentioned that Dave and I don't exist on sugar and butter alone? Well, here's the proof--I actually cook real food from time to time. And my favorite way make real food is to use my crock pot. I super dooper love my crock pot. It's so easy to throw a meal together in the morning or the night before and let my crock pot make dinner while I'm at work or busy with other stuff. Plus is makes the house smell so good. And this recipe is a perfect way to make a beautiful meal in just a few minutes. I've never actually roasted a chicken in the oven because it's just too easy to do it in the crock pot. The lemon and garlic in this recipe are complimented by the herbs and the meat is juicy and completely falls apart. A little messy for a pretty table presentation, but tasty and easy nonetheless. A friend of mine turned me onto Stephanie O'Dea's blog a couple of years ago when Stephanie challenged herself to use her crock pot every day for a year and blog the recipes. While I'm not quite as hard-core as Stephanie, there are currently 5 crock pots in my house and I've been known to run more than one (or two) at a time. Stephanie has a lot of wonderful recipes for crock pot beginners and more experienced cooks. Since I didn't have any fresh rosemary I used dry, but otherwise I followed the recipe, right down to skinning the chicken first (with all the butter I go through, I do try to cut the fat and calories when possible). I served this with jasmine rice and green beans for a simple dinner that was both healthy and tasty. Ooey, gooey cinnamon rolls. Is there really anything better to wake up to? On a cold winter morning when you don't really want to get out of bed. The type of morning where you know you'll end up wearing your PJs all day, unless you put in the effort to throw on a pair of yoga pants. The day you know you'll just want to snuggle on the couch watching trashy TV and eating guilty pleasure food all day. Well, if you know the night before that you're going to wake up to that kind of day, you want this recipe. You do all the work ahead of time and in the morning you'll actually want to get out of bed just to turn on the oven and get these lovely, sweet, messy, warm, tasty cinnamon roll baking just so you can devour the whole pan while watching [insert favorite reality TV marathon here]. Totally. Worth. It. I made these when Dave's cousin Mike and his wife Donna came to visit because I knew if I made them for just Dave and I, we'd eat the whole pan. Having guests eat a couple made it feel less indulgent. At least I guess so because Dave ate three of them. These were phenomenal. The filling is amazing and the dough is soft and perfect. Start to finish these guys do take about 16 hours, but most of that is resting time (in fact, I was surprised how little I worked with the dough). But you'll still want to plan ahead to make sure you'll be in the kitchen when you need to move on to the next step. Again: Totally. Worth. It. For about a year and a half, Dave and I have been fostering dogs for a rescue group called All Dog Rescue. It started as a way to volunteer and have a dog in our lives without committing to having a dog of our own. One day we'll be ready for that, but until then, wayward dogs come into our home, get love, attention, and training and eventually they move on to their forever homes. I like to think they occasionally think about us and all the belly rubs they suckered us into. Right now we have Mia, aka Mia Monkey, who is adorable and affectionate. And Mia loves cookies. While I can't verify the tastiness of these cookies, I think the fact that Mia would sit pretty every time I picked up the bag and look longingly at me is a testament that the puppy in your life will approve of these treats. Remember the other day when I said I only wanted to make a dozen cupcakes for Dave's birthday because I didn't want lots of leftovers? Well that was until the morning of the party when I learned everyone I invited was coming which would have meant only one cupcake per person. Ever the prepared hostess and not wanting to run out of cupcakes, I knew I needed to make another batch. But making second batch of the same kind of cupcake would be (of course) ridiculous (to me only) so I set upon finding another perfect recipe. Since I had Dave's vanilla fix covered with the Vanilla Vanilla Cupcakes, I figured I'd go with his second favorite flavor combo: chocolate and peanut butter. A little variety for our guests and a little chocolate for me. Plus I was interested in the peanut butter frosting. Both the cupcake and the frosting were phenomenal. The cupcake was rich and chocolatey with a fluffy texture. The frosting was amazing with a full on peanut butter flavor--almost like it was just whipped peanut butter with some added sweetness. They paired together beautifully. 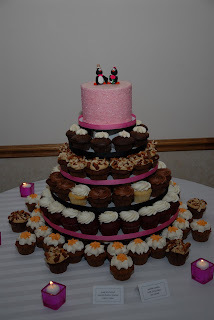 In fact, they were so perfectly rich with flavor individually that they begged to be paired with each other: the frosting needed to be matched with a rich chocolate to cut the intense peanut butter and the chocolate needed the saltiness of the frosting to tone down the richness of the cake. Truly a thing of beauty among chocolate and peanut butter desserts. Dave even commented on how they were so good they tasted better than our wedding cupcakes (which included both a vanilla vanilla version and a chocolate peanut butter version). I owe all my success with these cupcakes to Michelle at Brown Eyed Baker. Yet again another beautiful recipe that's easy to follow and hard to screw up. Just because Dave is such a fan of vanilla, I might scrape a vanilla bean into the batter or the frosting (or both!) in future renditions, but frankly these are perfect as is. They tasted and looked very professional, but more importantly, everyone loved them, including the birthday boy. I love cupcakes. I love that they are portable and portion controlled. I love that you can experience a unique and wonderful flavor without being overwhelmed by the idea of an entire layer cake made out of said flavors. 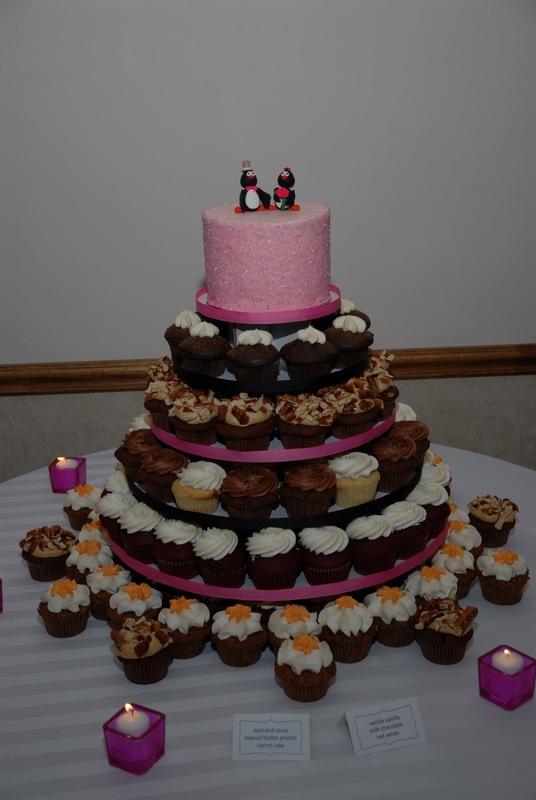 In fact, Dave and I had cupcakes instead of a traditional wedding cake, made of six different flavors and absolutely wonderful. But I've not tackled the cupcake phenomenon myself for a handful of reasons. I have trouble with frosting--both in the making and in the decorating. I've tasted cupcakes so delicious that if I attempted and failed I would be devastated. And let's face it, cookies are more my schtick. Cindy just keeps telling me I "haven't applied" myself to cupcakes yet. Remember that skillet I seasoned so well when I made Apple Fritters? Well, this seemed like the perfect way to test out how well I seasoned it. I made this for Thanksgiving and then ended up making it again for just Dave and I because it was the perfect cornbread to pair with spicy chili. The texture was perfect--a little crumbly but soft--and the pan really gave the bread a nice crust with some crunch but not hard or burnt. A super simple recipe, I was very pleased with how easy it was to make, despite being a little curious about cooking the bread on the stove top first. I found this recipe at Two Peas and Their Pod, but originally it came from Pioneer Woman (two of my favorite blogs). Leave it to Ree to come up with a way to bake a delicious, savory bread in a cast iron skillet. Plus, I kind love that it's round and served in triangles instead of the regular slices. If you don't have a cast iron skillet, Maria from Two Peas and Their Pod made this in a greased 9 inch round cake pan and baked in the oven (no stove top cooking). This would be fun for a winter dinner with friends or just as a side for a warm bowl of soup or chili. With the New Year upon us, I thought I'd share one of my goals for 2012 that I hope you enjoy. In an attempt to make you believe that Dave and I don't exist on pure sugar alone, this year you'll see a different type of expansion into a little bit of savory stuff, appetizers, and perhaps a dinner here or there. Maybe I'll throw in a treat I've made for the pups. I also want to share with you some party food and party planning tips, since it's kinda my thing (I spent part of my life as an event planner and we host a lot of parties). Wishing you the best in 2012 and looking forward to seeing you around here for some more fun!